Warning to readers. This is a story of 56 years of a “mistaken identity.” A miracle, if I may proclaim it. In this fourth issue of a series on “success post encephalitis,” you might find yourself amazed by the resilience of the human spirit. In November 2011, I had the momentous occasion to meet Carol Sues at an encephalitis survivor/caregiver conference. She was 58 at the time. It had been 56 years since being stricken by encephalitis, a brain injury. She fought seizures, mostly depended on a wheelchair or walker, spoke in 2-word phrases, lived in a group home and relied heavily on her sister to complete her thoughts while she anxiously shuffled postcards. I sought to understand her, but admittedly was too early in my own post-encephalitis journey to know how to bond with others in a way that held meaning. Something I learned about Carol that year was that despite being a thriving toddler, encephalitis compromised her abilities, including balance, speech, expression and mobility. Doctors offered little hope after her illness, concluding, “She’ll never walk, talk or be independent. Might as well put her in an institution.” That was 1955. Carol wasn’t allowed to go to public school. Instead, she attended a school for the developmentally disabled. At age 32, she moved into a group home, where she was assisted by caregivers, not medical professionals, who affiliated her with residents with intellectual disabilities. Because of her limited speech, most assumed she could not make decisions such as what to eat, wear, listen to or participate in. She couldn’t express herself because words did not come easy. Simply … she wasn’t taught and had no therapy, so she existed in the world that was given to her. Compliant. Patient. A testament to her character. However, Carol’s spirit craved to be “normal.” While her parents were alive and cared for her, she mimicked her sister’s life by participating in neighborhood games such as kickball and throwing hoops. Her father built her a homemade skateboard that she could sit on to address the balance issues since a bike was out of the question. And Carol loved it. Being able to be part of the group meant being real. Her family had questions … she didn’t fit the mold of prenatal intellectual disability given her encephalitis onset after acquiring the mumps at just shy of 2 year old. In the absence of a neurologist who understood encephalitis in the 1950s, Carol developed her own means of developing skills for reasoning, writing, speech and spelling, among others. When I asked Carol about her first memories after her illness, she remarked that her headaches were a 10 out of 10 … in our words, “cataclysmic.” Spells riddled her daily … what she later learned were seizures. 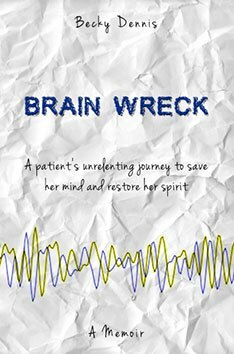 As the headaches and seizures rocked her world, she grew silent. She didn’t understand them or how to express them, so she would bang her head on the floor, leaving those around her to conclude these were “temper tantrums.” Her family’s intuition, however, caught on that smelling salts often remedied these episodes. Like mimicking her sister’s outdoor neighborhood life, Carol applied her own insights to help her read and write. Her biggest assistance? Texas Instruments’ plastic “Speak & Spell” released in the 1980s, where she learned to spell and write, wearing out the keypad on this learning device. Another favorite? The Etch a Sketch drawing toy from the 60s taught her hand-eye coordination. She enjoys ‘60s music and the TV is always on to absorb info. Another source of her learning is attending church, listening to hymns and learning more words while embracing a higher spirit, something she continues to enjoy and grow from. Carol is a blessing … teaching us so many aspects of irrepressible strength. When I finally asked her what success was post encephalitis, her answer was crisp, “Travel!” She knew the intent of the interview, so had been eager to answer this question, listening intensely. Since early on, Carol always wanted to go to the Grand Canyon. Excitedly, Carol repeated “Grand Canyon!” a few times … an obvious milestone in her life. In addition to this life-long dream, she’s been on 18 cruises now, with Barbados and Key West among her favorites. Her most frequent destination? Las Vegas. Goes there for her birthday each year and to visit her best friend. What drew me most to Carol for this story was her amazing improvement after 58 years. When I met her at Encephalitis Global’s survivor/caregiver conference 4 years ago, Carol met others with similar residuals for the first time. She heard doctors who specialized in this brain injury explain encephalitis in layman’s terms and finally understood her illness. She wasn’t “stupid;” she had damage from a virus. Life became different. She suddenly had a voice. She didn’t have to keep her experience all to herself anymore. At this turning point, Carol became vocal about encephalitis, reducing her own shame about someone she wasn’t. Her vocabulary expanded. Her moods were easier to read as she felt empowered to express herself. She began ordering from the menu, now enjoying a wide variety of foods vs. the bland forced repeats she tolerated for decades. While interviewing Carol, she grabbed her postcards almost immediately, shuffling as she processed questions and answers. 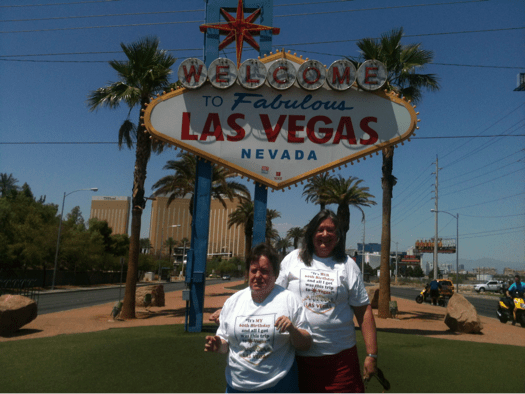 The cards help ground her to the many trips she’s experienced and reach into her memory bank. They are helpful in times of uncertainty while shifting from the focus on her to something tangible she enjoys. Carol’s level of empathy raises the hairs on my neck each time I recall this moment. She is wise beyond any of our comprehension. I respect how she studies people, as if searching for the few souls who will befriend her. If she trusts someone, they become part of an “inner circle” that she is quick to express her love. Beyond travel, Carol’s biggest success seems unimaginable. With her family’s support, she moved into her own home earlier this year … independence that she deserved in her sixth decade. She has a service provider who assists she and one of her best friends. Carol enjoys looking out at her own basketball goal that reminds her of fond childhood memories when she was first treated like a person with a voice. Not trapped in a prison-like world that dictated her choices. What’s fun about witnessing the love between Carol and her sister Debbie is the natural jabbing that comes with siblings. Carol asks, “Debbie, do you know where you’re going?” Her sister instilling confidence. An hour later Carol asking, “You’re lost, aren’t you?” They share traits I enjoy with my own sister … mischief, rolling eyes, funny memories, expressions unique to each other, faith, translating each others’ thoughts/feelings. Give the child time to absorb the question. Rephrase the question if it doesn’t make sense to the survivor. Study facial expressions for the survivors’ experience. Attend encephalitis survivor/caregiver meetings to relate with others. Invite the medical community to be part of “our world” so that we are real and aren’t just a text book. For 56 years, Carol didn’t understand her own identity. Thank God for the doctors from the International Encephalitis Consortium who volunteered their time to help survivors learn more about themselves. What a difference. Beyond this remarkable character who I’ve grown fond of, it’s heart warming to see how happy she is: accepting her life for what it has been, without looking back.